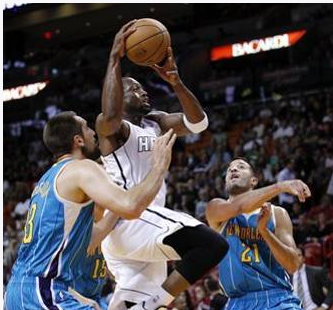 MIAMI (AP) — For the Miami Heat, one nearly perfect quarter was more than enough to help stop a two-game slide. Dwyane Wade scored 26 points, LeBron James finished with 24 points and seven assists, and the Heat shot a season-best 58 percent on the way to topping the New Orleans Hornets 106-90 on Saturday night. Chris Bosh scored 13, and Ray Allen and Shane Battier each added 11 for Miami, which took control by outscoring the Hornets 33-10 over the final 11 minutes of the second quarter. New Orleans started the game 10 for 12 from the floor, then shot 9 for 31 over the rest of the half. Ryan Anderson scored 24 for New Orleans, which got 20 from Robin Lopez and 12 from Jason Smith. 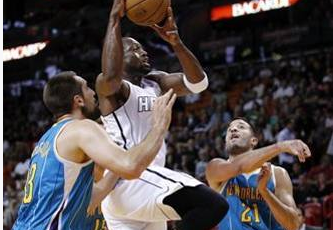 The Hornets turned the ball over 19 times, and Miami converted the miscues into 22 points. New Orleans outscored Miami by one point in the first quarter, and one point over the course of the second half. The Hornets only got to the foul line 13 times, compared with 24 for the Heat. James has scored at least 20 points in all 18 Miami games this season. He tied a Heat record by scoring 20 in 23 straight regular-season games (going back to last season) and 39 consecutive games overall, including playoffs. He made 10 of his first 11 shots on Saturday. The Heat have been plagued by defensive issues at times this season, especially lately, and they looked to have returned in the early going on Saturday. The Hornets ran out to a 25-18 lead by the time this game was 7 minutes old, playing almost flawlessly in the early going. It didn’t last much longer. Not only did Miami soon clamp down on the defensive end, the Heat offense began really clicking as well. Take away Smith’s 5-of-7 effort in the second quarter, and the rest of the Hornets shot 2 for 13 in those 12 minutes when the game turned. Miami outscored New Orleans 33-15 in the quarter – James, Bosh and Wade outscored the Hornets by three – and seven different Heat players had at least one assist in that period alone. New Orleans’ starters were 1 for 2 in the pivotal second quarter, both of those shots by Lopez. Anderson was limited to 31 seconds of time on the court in the second because of foul trouble, and the other three Hornets starters besides Lopez failed to get a shot off in more than 12 combined minutes. By halftime, Miami’s lead was 64-47, and the Heat weren’t in much trouble again – though they had to work in the final minutes to finish off the team with the worst record so far in the Western Conference. Anderson and Greivis Vasquez made consecutive 3-pointers to get the Hornets within nine late in the third quarter. And with 4:40 left, Lopez’s three-point play helped New Orleans close to 95-87. That was the last gasp for New Orleans. Battier took a pass from James and made a 3-pointer from the right corner with just under 3 minutes left, giving the Heat a 101-87 lead, and Wade sealed it with a jumper on the next Miami possession, part of what became an 11-0 game-deciding run.